Goodyear Malaysia Continues its Commitment to Improve Public Health and Safety by Supporting St. John Ambulance with High Quality, Long- Lasting Tires. 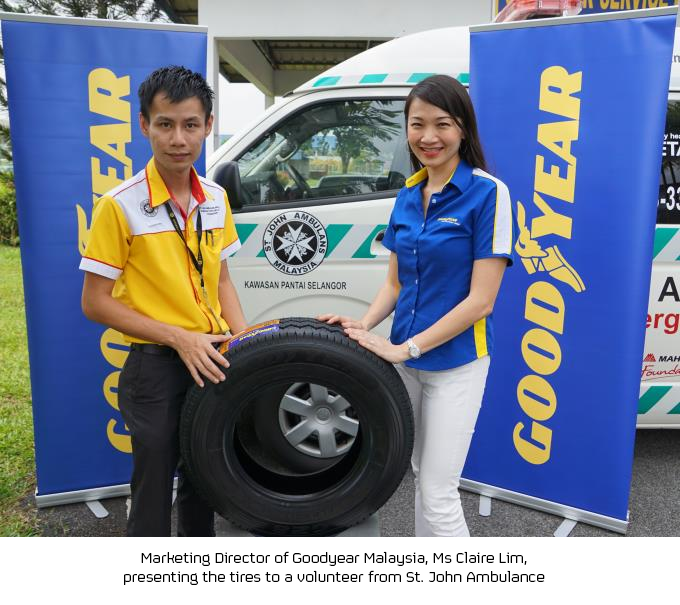 KUALA LUMPUR, August 18 2015 – Goodyear Malaysia has demonstrated its support for improving public health and safety in the local community by providing St. John Ambulance of Malaysia’s first aid service vehicles with high quality and long-lasting tires. For the past nine years, Goodyear Malaysia has sponsored St John Ambulance through supplying it with quality tires. This year, Goodyear will supply 16 sets of tires, which will be fitted to the St. John Ambulance’s Toyota HiAce vehicles. “Goodyear has a long history of supporting its local communities around the world. The company strives to build relationships with organizations and people working to make their neighborhoods stronger. This mindset is reinforced throughout the company’s shared value of ‘caring for our communities’,” said Claire Lim, Marketing Director of Goodyear Malaysia. “Goodyear Malaysia recognizes St. John Ambulance’s contribution of providing first aid services to the Malaysian society whenever they are needed. They play an important role in training volunteers to save lives as well as keeping people safe at events with their first aid knowledge. St. John Ambulance was started in the early days of the Industrial Revolution in Britain, addressing the needs of the sick and the injured and bringing them to hospitals for immediate attention. St. John Ambulance of Malaysia was established in 1908, initially serving as stretcher bearers and first aiders due to increasing military and civilian casualties throughout the country. In addition to rendering first aid and home nursing services, the organization now also carries out community projects such as mass Cardiopulmonary Resuscitation (CPR) training, Citizen Action and Response in Emergencies (CARE) and many other initiatives. Through volunteer services and the assistance of individuals and corporations such as Goodyear, St. John Ambulance of Malaysia is able to advance its vision of being a well-organized body that is dedicated to the service of mankind. “We are pleased to have the support of Goodyear and their products to help ensure a smoother and safer drive as we respond to first aid emergencies. With their assistance, we can certainly seek to provide the highest quality of first aid assistance to serve the Malaysian community,” said Dato’ Yeo Kim Thong, St. John Ambulance of Malaysia – State of Selangor. Through Goodyear Malaysia’s community outreach program, support is extended to organizations with a focus on enhancing safety and well-being and improving education, as well as offering volunteering opportunities for Goodyear associates. Other organizations the company has supported include the Spastic Children’s Association, the Malaysian Association for the Blind, the Independent Living and Training Centre, the National Kidney Foundation and Mercy Malaysia.